means look towards the future in Cree. This program was established to address the problems faced by Edmonton’s Indigenous Youth as they struggle to break the cycle of poverty, abuse, addictions, lack of employable skills, dysfunctional habits and long term unemployment. The problems faced by the youth are a result of early socialization and have developed as a response to their environment. These problems have deep roots and are not addressed in a series of workshops via drop-in programs. Our holistic programming provides youth with basic needs such as bus tickets, breakfast, lunch and for a smaller group supper. We also provide counselling, legal support, indigenous role models, one on one and small group counselling, addictions services, suicide prevention, visits by public health nurses, parenting programs, housing and financial referrals, multiliteracies including financial literacy and a bridge to Inner City High School. 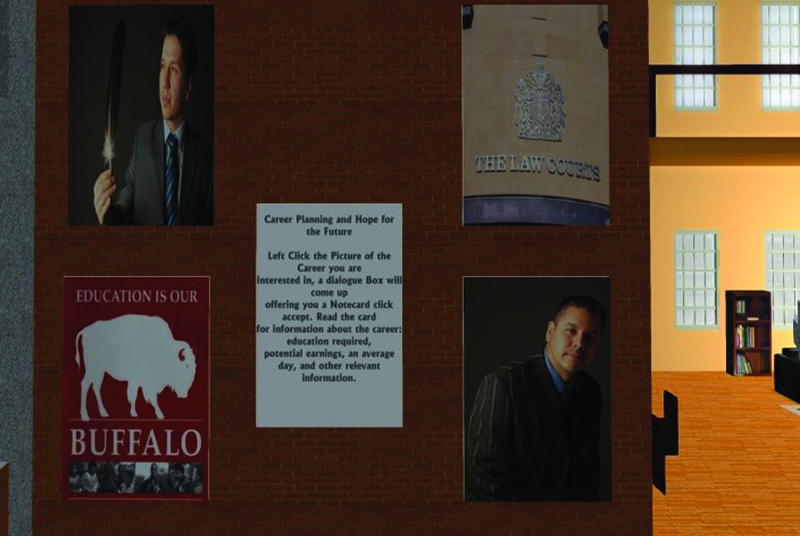 Two of the more recent developments in our programming are the position of a court worker or navigator assisting youth with justice and legal support and the growth of our programming in the virtual world. Eighty to ninety percent of our youth have had contact with the justice system. The court worker keeps track of the youth’s court dates, accompanies them to court and if necessary represents the youth in court. The worker helps Indigenous youth navigate the court system, works with duty counsel, crown attorneys, and court clerks to vacate warrants, supervise community service court orders, and other court ordered requirements. This position helps keep youth out of jail and prevents contact with a more hardened criminal element. We are also in the process of developing three connected private islands in the virtual world of Second Life. The three Islands illustrate the Past, Present and Future. The Island presenting the past is reminiscent of 1750s Alberta and introduces treaties, reserves, residential schools and a positive future that sees education as the new buffalo. This virtual environment has been toured virtually and approved by two Elders. The second connected virtual island, the Present, is under construction and is intended to represent life in inner city Edmonton. The design of this virtual environment is informed by the input of several Indigenous youth. The challenge of this virtual environment is in overcoming the barriers to development that the inner city environment presents for Indigenous and other youth. Overcoming these challenges is the gateway to the next connected virtual island of Urban Hope. Urban Hope (the Future) is also under construction and focuses on career planning and education. If you have questions on Negan Tepeh, please contact us.